Manchester City sealed their place in next season's Champions League by crushing Watford to finish third in Pep Guardiola's debut season. City skipper Vincent Kompany was left unmarked to head in an early opener before Sergio Aguero twice clinically fired in after quick counter-attacks. The Blues, needing a point to guarantee a finish in the top four, were 4-0 up at half-time after Fernandinho bundled in. 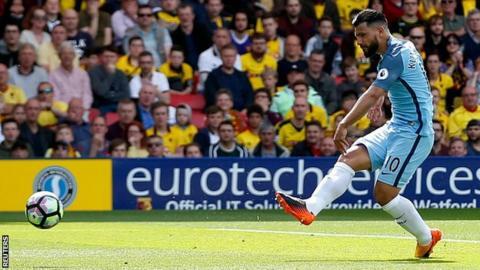 Gabriel Jesus clipped in a fifth after the break as Watford ended the reign of departing manager Walter Mazzarri with a shocking display. Mazzarri, who leaves after just one season, was booed by some Hornets fans during the game as the hosts suffered a sixth successive defeat to finish in 17th place. Guardiola is one of the most celebrated coaches in world football and joined City, when he succeeded Manuel Pellegrini last summer, with high expectations after success-packed spells at Barcelona and Bayern Munich. The 46-year-old former Spain midfielder led Barca to 14 trophies - including three league titles and two Champions Leagues - in four years, then guided Bayern to league titles in each of his three seasons in Germany. However, his debut season in England has not ended in trophy presentations and victory parades. City fans hoped his arrival would produce their first Premier League title in three years, but, despite winning their opening six games, they have faced a tense battle to finish in the top four. Few would have predicted that direct qualification into the Champions League would only be sealed on the final day, as his side held off Liverpool and Arsenal. In the end, there was little cause for concern in a routine victory. City were imperious from the opening whistle, easily finding space and clinically finishing their chances against hapless Watford, who were without six recognised centre-backs through either injury or suspension. The Blues have now reached the Champions League for a sixth successive season - and are hoping for an improved showing under Guardiola next season. "Next season I can assure you we will come back stronger," said Guardiola, who finished outside of a league's top two for the first time in his managerial career. Will Aguero and Toure stay or go? So how will Guardiola look to improve this City squad next season? It is a question he was not willing to answer in his post-match interviews. Several players - notably Yaya Toure, Pablo Zabaleta, Jesus Navas and Bacary Sagna - are out of contract in the summer, while there are still question marks over Aguero's future. Aguero has proved to be one of City's all-time greatest players since his £38m arrival from Spanish side Atletico Madrid in 2011, scoring 179 goals in 253 appearances to help the Blues win two Premier League titles and two League Cups. It seems unthinkable that they might be willing to let him leave - especially after a performance like this at Watford. The 28-year-old Argentina striker was irrepressible. His movement constantly stretched the Watford defence, creating chances for himself and the team, and his own chances were sealed by trademark clinical finishing. Aguero, whose second took him to 20 league goals for a third consecutive Premier League season, was denied the chance to complete his hat-trick when he was substituted in the 71st minute to a rousing ovation from the away fans. Those supporters must surely be hoping it was not a final farewell to a club legend. Watford have shown glimpses of their potential this season, most notably a home win against Manchester United, but those moments have been few and far between under departing manager Mazzarri. The Italian, whose exit after just one season in charge was announced last week, insisted he had achieved his objective this season - keeping the Hornets in the top flight. However, Watford chairman Scott Duxbury clearly disagrees. "We have aspiration and ambition. There have been some pundits lately saying we should just be happy with just surviving and the crumbs of the Premier League table," he told BBC Radio 5 live earlier on Sunday. "I'm sorry but we want more than to survive." Before Mazzarri's dismissal was announced, reports suggested he had fallen out with some players - including captain Troy Deeney - while some fans were concerned his lack of English meant he struggled to communicate with his squad. The Italian was greeted by some angry supporters when he arrived at Vicarage Road before kick-off, and many chanted for him to be sent off when he was reprimanded by referee Kevin Friend in the second half. His sacking one season into a three-year contract means the Hornets are looking for their eighth manager in five years since the Pozzo family took control of the club. "It is important to speak English if you are a manager. They cannot pass on instructions to the players but he tried his best and we thank him for it. "The club had to make a decision, and they did. The language didn't help him. We apologise for some of our mistakes - we can't just blame the manager." I want to thank the fans because they were patient. They supported the players on the pitch. It was not easy. "Look how many players were missing. When we had the full squad we were seventh, we reached 40 points with six games to go. "We were missing six defenders today. This has never happened to me in my whole career. "I had a lot of satisfaction in England this year. If there is a team that would make me competitive enough in the league I would consider staying." "I was so happy with this season. We fought in all competitions and the only regret is that we did not fight until the end. "We are so glad to be third because every season is tougher and tougher to reach the Champions League. "The gap is too big so we need to play better - not work harder - to be closer to Chelsea and Spurs. "This is one of the best groups I have coached. It has been a privilege to work with these guys." Manchester City have finished in the top four in the Premier League in seven consecutive seasons - the longest active streak of any team in the competition. They recorded their 12th league away win - their joint-most in a single campaign (also 12 in 2001-02). Aguero became the fifth player to score 20+ goals in three consecutive Premier League seasons (after Shearer, Henry, Van Nistelrooy and Kane). Kevin de Bruyne has provided 18 assists this season after teeing up Kompany and Aguero's first. Only Thierry Henry in 2002-03 (20) and Mesut Ozil in 2015-16 (19) have made more assists in a season. Gabriel Jesus has had a hand in 11 goals in eight Premier League starts for City (seven goals, four assists). Watford suffered their joint-heaviest league defeat (also 5-0 v Wimbledon in December 1999 and 6-1 v Liverpool in November 2016). The Hornets conceded 23 league goals from crosses this season, more than any other side. Match ends, Watford 0, Manchester City 5. Second Half ends, Watford 0, Manchester City 5. Attempt missed. Kevin De Bruyne (Manchester City) right footed shot from outside the box misses to the right. Assisted by Gaël Clichy. Offside, Manchester City. Jesús Navas tries a through ball, but Gabriel Jesus is caught offside. Substitution, Watford. Dion Pereira replaces M'Baye Niang because of an injury. Attempt blocked. Etienne Capoue (Watford) right footed shot from the right side of the box is blocked. Assisted by Andrew Eleftheriou. Corner, Watford. Conceded by Fernandinho. Corner, Watford. Conceded by Gaël Clichy. Attempt blocked. Abdoulaye Doucouré (Watford) right footed shot from very close range is blocked. Corner, Manchester City. Conceded by Heurelho Gomes. Attempt saved. Sergio Agüero (Manchester City) right footed shot from the centre of the box is saved in the top right corner. Attempt saved. Sergio Agüero (Manchester City) right footed shot from the right side of the box is saved in the top centre of the goal. Assisted by Jesús Navas. Substitution, Manchester City. Bacary Sagna replaces Yaya Touré. Corner, Manchester City. Conceded by Valon Behrami. Substitution, Watford. Troy Deeney replaces Nordin Amrabat. Goal! Watford 0, Manchester City 5. Gabriel Jesus (Manchester City) left footed shot from the centre of the box to the top left corner. Assisted by Sergio Agüero. Attempt missed. Sergio Agüero (Manchester City) right footed shot from the centre of the box is close, but misses to the right. Assisted by Leroy Sané. Foul by Brandon Mason (Watford). Attempt missed. Stefano Okaka (Watford) right footed shot from the centre of the box misses to the right. Assisted by Tom Cleverley with a cross following a corner. Corner, Watford. Conceded by Willy Caballero. Attempt saved. M'Baye Niang (Watford) left footed shot from a difficult angle on the left is saved in the bottom left corner. Attempt saved. Stefano Okaka (Watford) right footed shot from the left side of the box is saved in the top right corner. Assisted by M'Baye Niang.